Two years ago I started to work with Angel Cards. First I used them for myself, asking for guidance in challenging times. Very soon after I was asked to take my Oracle cards with me to a coaching event and I noticed how easy it was for me to work with them. From then on I used the Oracle cards in my practise and during my yoga classes. I find them very useful as a guide. They align me again with the path of my heart when I tend to overthink. At Emporium of Wonders in Amsterdam East I had many sessions in my healing hut and now the new store has opened in de Pijp, I couldn’t resist offer my sessions there too. Since a few weeks I started to give sessions there and I love it! 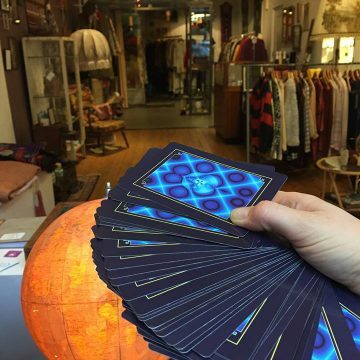 A card coaching session is a card reading (no tarot but oracle and fractal cards) with a nice chat and loving ears that can help you to align with the path of your heart and give clarity and advice how to improve or to deal with situations. In general the oracle card coaching sessions will give you clarity and guidance. All questions, themes big or small are welcome. Next to my oracle cards I use fractal cards. All the cards in this deck have a ”psychedelic” image and word that vibrates deeply in your system and can empower you to make healthy changes and to understand situations on a deeper level. Of course my cards won’t predict the future or tell you exactly what to do, but they can give guidance and clarity, as they did many times before for myself and others. No question is too weird, no challange or difficulty too big or small.